I have been bitten by the Gypsy bug! And I want you to be bitten, too! There is a quilt by Jen Kingwell that caught my attention awhile ago, but I didn't have a pattern. It looked like a lot of fun to make, but did I really need to take on another quilt project? I already have more completed quilts and more quilts-in-progress than any one person should have! But then, I saw the pattern at retreat and Nancy just flaunted it at me the whole time. Who could resist? So, we found out that Jen Kingwell is now a designer for Moda Fabrics. And at Houston Quilt Market last fall, we met her and loved looking at her samples and designs. Below is the Gypsy Wife Quilt covering a table. And both Debbie and I agreed that her fabric designs (below) were something we really liked, so it has been ordered for Bear Patch and is supposed to be released in April. Keeping my fingers crossed that we will get an early shipment. With her connection through Moda, her patterns are more readily available and less expensive without shipping from Australia. You can call Bear Patch (651-429-1039) to order your own pattern. 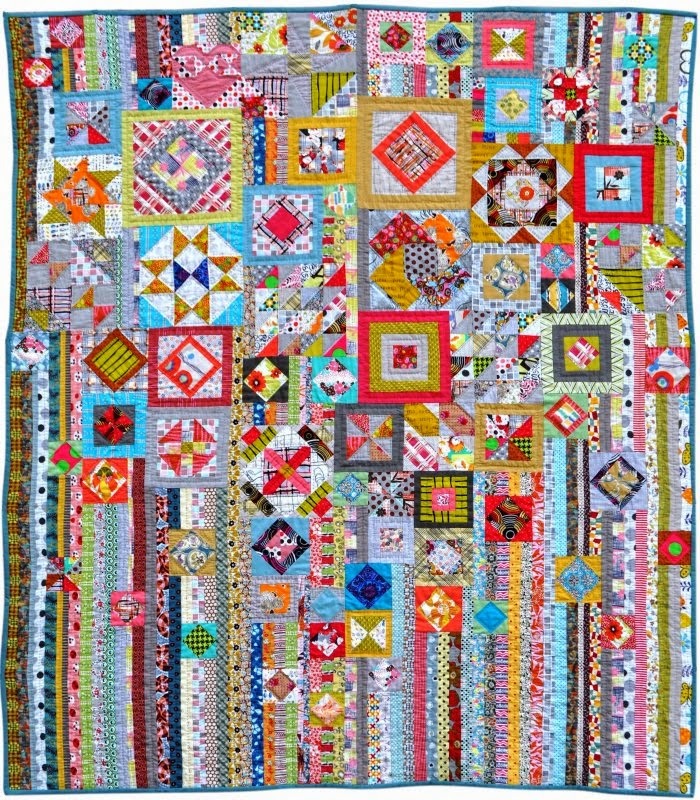 Here's a picture of the entire quilt, not the designer's original quilt but made by someone else and posted on Flickr with other gypsy quilt pictures. So, I have a plan. Well, actually, I am following a plan made by someone else. On the Factotum of Arts blog there is a schedule to make all of the blocks over a year's time. I think I can do this! How about you?! We can stay in contact and share pictures back and forth via email and our blog. It's easy to hop on the Gypsy bus because the first month's task is to pick fabric. And the fabric I picked is not a complete picture of what I want to use, but it's enough to get me going. And gives me a good excuse to both shop my own stash as well as pick up new goodies as they come to Bear Patch! I'll take a picture of my fabric selection and put it here for you to see. And maybe take some inspiration to start your own! I have them up on the design wall so I can see if the colors are what I want and where I want. There is one large block, and I even found a "P" (for Pam!) to put in the center to begin the process. Then 6 small pinwheel blocks, with borders added to 4 of them. So far, the directions have been good and the process painless. And the month isn't even done yet! Next month will be another large block and 6 different small ones. Easy! What Do All Those Numbers and Letters Mean?